25 years ago this month, 8th July 1980, and 40106 shunts coal wagons at Bangor whilst working Trip 46 from Llandudno Junction to Bangor, Gaerwen and Amlwch. Despite its apparent unsuitability for such a task on the grounds of weight and length, 40106 has just been shunting the sharply curved coal yard sidings at Bangor. Also suprising is the fact that the coal wagons visible are all unbraked, but Trip 46 was an air-braked working (for the Octel chemical tanks) so all coal traffic would have been worked as unbraked anyway. These empties will be conveyed to Gaerwen and left in the sidings there to be collected later. Note also that the headshunt at Bangor was often not used for shunting between the yard and main sidings, the loco shunting out into the tunnel instead. 40106 was a 'celebrity' loco, having retained its BR green throughout its career. In the late 70's it finally went to Crewe for overhaul, but managed to avoid being painted blue. It is preserved on the Nene Valley Railway. 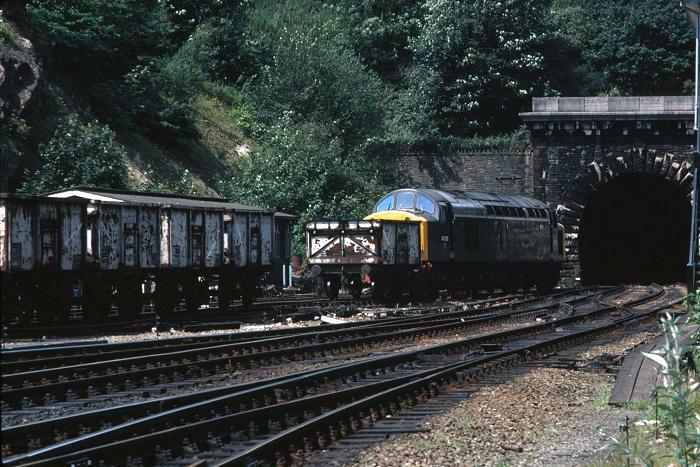 Coal traffic to Bangor and Gaerwen ended in March 1984.